After years of loss-making arable and dairy farming, restoring the Repton park around the house in 2002 showed us a way to work with the land, rather than constantly battling against it, and we decided to roll out nature conservation across the whole Estate. Our approach, however, is radically different to conventional nature conservation. Ours is a ‘process-led’, non-goal-orientated project where, as far as possible, nature takes the driving seat. This 'hands off' approach, which is also considerably less expensive in terms of management, is now known as ‘rewilding’. Crucial to the project are our herds of free-roaming grazing animals - old English longhorns, Exmoor ponies, Tamworth pigs, and red and fallow deer. Their different grazing techniques and methods of physical disturbance – from trampling and puddling to rootling, rubbing, snapping branches and de-barking trees – together with their ability to transfer nutrients and disperse seeds over wide areas, create a complex mosaic of habitats across the whole Estate. We have also restored natural water systems, including 2 kms of the River Adur, allowing the land to 'wet up' and create dynamic aquatic habitats. Knepp's heavy clay soil is perfect for this. Since the project began, the Estate has seen extraordinary increases in wildlife. Extremely rare species like turtle doves, nightingales, peregrine falcons and purple emperor butterflies are now breeding here; and populations of more common species are rocketing. Knepp Wildland has become a beacon for conservation in the UK, demonstrating how cataclysmic declines in wildlife can be reversed in a very short space of time, even on post-agricultural land and in the most populated part of the country - if only nature is given a chance to operate. While the Estate is still producing food in the form of organic, pasture-fed meat from our free-roaming herds, the emphasis now is on 'ecosystem services' - the other vital public benefits that the land can provide, such as soil restoration, flood mitigation, water and air purification, biodiversity, pollinating insects, carbon sequestration and, of course, an amenity for human enjoyment. 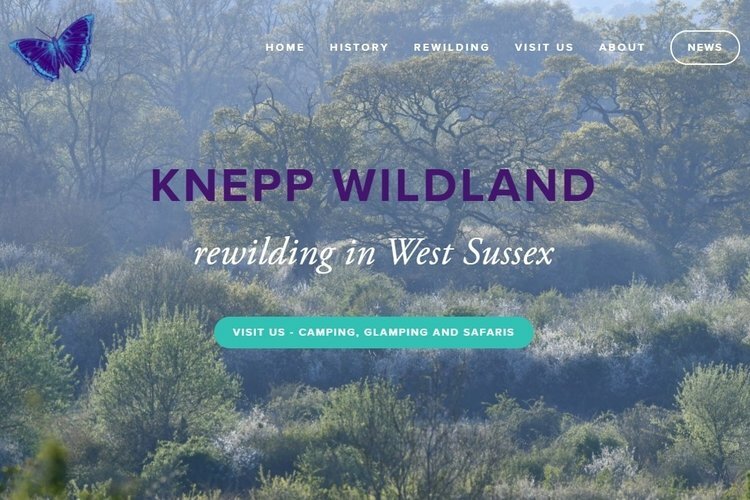 Our tourism venture, Knepp Wildland Safaris & Camping, represents an important new income stream for the Estate.